Professor Cynthia Pine presenting at the dental seminar: Preventing tooth decay in childhood: measuring the benefits and counting the costA seminar: “Developing a range of methods for economic evaluation of dental services: widening the perspective” organised by the Centre for Health Economics and Medicines Evaluation (CHEME) took place recently at Bangor University. Understanding that most dental caries is preventable, particularly in young children, means that the costs are also largely preventable. In the financial year of 2015 -2016, Public Health England reports the cost of tooth extraction topped £50.5 million in children aged 0 to 19 years. 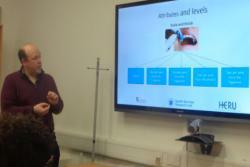 This seminar brought top researchers in health economics and dental public health from across the UK to deliberate, present and set the road map for the future of dental care research. Professor Paul Brocklehurst, Director of NWORTH Clinical Trials Unit at Bangor University and an Honorary Consultant in Dental Public Health; Dr. Dwayne Boyers from the Health Economics Research Unit at the University of Aberdeen, Professor Cynthia Pine from the Institute of Dentistry Queen Mary University London and Dr. Victory Ezeofor from the Centre for Health Economics and Medicines Evaluation (CHEME), Bangor University all gave presentations. A report from Public health Wales in 2018, highlights that child oral health is poor with the highest tooth decay rates seen at ages 3, 5 and 12. Across the UK, tooth decay is common in children with more than a quarter of five year olds experiencing tooth decay in several teeth. This presents an avoidable high cost to the NHS, particularly when considering it is the most common reason for childhood visits to hospital Emergency Departments. Childhood dental decay is linked to poverty with several studies showing that children living in more socioeconomically deprived areas have worse oral health. This is one of Professor Paul Brocklehurst presenting at the dental seminar: Change in the Dental Landscapethe most marked indicators of inequality in health across the UK. 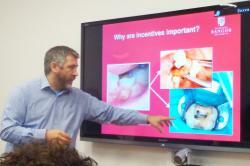 The seminar raised key questions around access to dental care, provision in schools and the dental contract, i.e. how dentists are paid. Professor Paul Brocklehurst emphasized that the “one size fits all approach” does not work in dental care and suggests the need to change how dental surgery contracts are managed within the NHS. Dr Dwayne Boyers raised the question - should the NHS pay for non-health benefits, such as the cosmetic and reassurance aspect of scale and polish in a publicly funded healthcare system if they are not clinically effective and necessary, even if people value them? 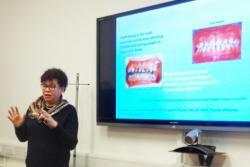 Professor Cynthia Pine’s research in Tayside, Scotland, has collected data for a tooth brushing programme for nearly two decades. They now have follow up data for participants who started the programme at 5 years old and are now 23 years old adults. Developing a pattern of brushing from an early age, as part of a bedtime routine has had a huge positive impact in their oral health and dental care as adult, with associated cost savings. Dr Dwayne Boyers presenting at the dental seminar: Economic evaluation in dentistry, using cost benefit analysis to widen the valuation spaceDr Victory Ezeofor and Dr Joanna Charles stated that health economic evaluation of dental care programmes should inform service commissioning, but applying the appropriate tool to capture the evidence is challenging. She added: “We are keen to work with other health economists across the UK to develop the most appropriate methods for capturing costs and benefits from universal and targeted interventions for children to prevent unnecessary suffering and cost”.